Bernhard is regarded by analysts as the most likely successor to CEO Dieter Zetsche. 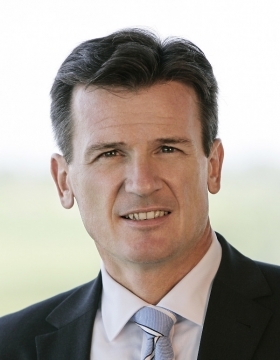 BERLIN (Bloomberg) -- Wolfgang Bernhard, production chief at Mercedes-Benz, has made four trips to central Hungary since rejoining the Daimler AG management board a year ago. His career depends on a factory being built on the region's sandy soil. The 800 million-euro ($1.1 billion) plant near the city of Kecskemet has received special attention from Bernhard, regarded by analysts as the most likely successor to CEO Dieter Zetsche, because it's the location where Daimler plans to build two compact cars. The 50-year-old executive, who made headlines when he roared into the 2003 Detroit auto show on a Dodge Tomahawk motorcycle, has kept a low profile since returning to Daimler in 2009, five years after being pushed out by former CEO Juergen Schrempp. Bernhard's main challenge is making factories run more smoothly as Mercedes lags behind BMW AG and Volkswagen AG's Audi in filling assembly lines. "Bernhard is the central candidate for the top job," said Stefan Bratzel, head of the Center of Automotive Management in Bergisch-Gladbach, Germany. "But he's got a lot to do. Daimler's results in recent years have resembled a rollercoaster ride. Continuity is a key challenge." After initially leading the unit that makes Sprinter delivery vans, he was promoted to the manufacturer's management board a year ago today, and charged with boosting profit margins at the world's second-largest maker of luxury vehicles. The lack of consistency was evident in the fourth quarter. Mercedes earnings before interest and taxes slipped to 8.3 percent of sales from 9.5 percent in the third quarter. "It's clear that Mercedes was below expectations," said Stefan Bauknecht, a fund manager with DWS Investments in Frankfurt. "A 9 percent margin should have been possible." Daimler's car unit, which includes Mercedes, the Smart city car and the ultra-luxury Maybach brand, targets consistent profit margins of 10 percent by 2013. The company is aiming for the boost even as it doubles the lineup of small cars, which are typically less profitable than big sedans like the E- and S- Class. Small cars are critical for Mercedes to meet tighter emissions standards and keep pace with BMW and Audi in sales. Mercedes also needs new models to attract younger drivers to the brand, with its average customer older than competitors. A revamped B-Class, the first of the line, will be introduced later this year. A compact hatchback, coupe and sport-utility vehicle are also planned. The Daimler unit, which accounted for 65 percent of the group's 7.3 billion euros in 2010 operating profit, will probably use 88 percent of capacity at European factories this year, compared with 92 percent at BMW and 93 percent at Audi, according to data from IHS Automotive. Mercedes in 2011 aims to beat record output of 1.21 million vehicles this year. Last year's production at an all-time high came even though the carmaker started the year with factories running on reduced schedules. Bernhard spent much of 2010 convincing staff and suppliers that the turnaround in demand was for real and that overtime instead of short workweeks was necessary, said a person with direct knowledge of his schedule. The former chief operating officer at Chrysler, where he worked alongside Zetsche when the unit was still part of Daimler, declined to be interviewed for this story. Daimler doesn't comment on the activities or schedules of individual executives, spokesman Marc Binder said. Bernhard, who started his career as a consultant with McKinsey & Co., developed production line expertise as a manager for S-Class assembly between 1994 and 1999. In his current position, he typically conducts meetings on the factory floor rather than conference rooms to see problems first-hand. He also gets involved in minute details, such as changing the process for installing wire harnesses to make it easier for workers and reduce the time needed for the task by about 20 percent, a person who's worked with him said. Despite improving Mercedes' fourth-quarter margins by 3 percentage points compared with last year, Bernhard has bigger challenges waiting, including making profitable cars at Kecskemet and its sister plant in Rastatt, Germany, and addressing sensitive issues like taking small-engine production away from the high-cost Stuttgart plant. "If Bernhard's going to progress, then he needs to successfully implement long-term strategy," said Christoph Stuermer, a Frankfurt-based analyst at IHS Automotive. "The current A- and B-Class made only a marginal contribution to profitability." After challenging Schrempp and subsequently losing his position as head of Mercedes in 2004, Bernhard led Volkswagen's namesake brand for less than a year before again losing a power struggle, this time with Chairman Ferdinand Piech. He also antagonized VW unions by threatening to relocate Golf assembly outside Germany. Since returning to Daimler, he's stayed out of the public eye and taken on a more collegial tone, meeting foremen on the factory floor and extolling the virtues of teamwork in town hall meetings with workers, according to two people who worked with him. Zetsche, 57, has a contract running until the end of 2013. "Bernhard had acquired a reputation as a ruthless cost-cutter, but now he has to make a name for himself in the more subtle art of people management," said IHS's Stuermer. "It's very important at Mercedes to become a good guy to work for, someone who's not going to bruise people with big egos."